When did meteorites and asteroids really strike the Earth and the moon? How often did they hit the Earth and the moon? These are some of the questions physics professor Nicolle Zellner has been exploring while on sabbatical researching microscopic pieces of glass left on the moon’s surface by the impact of meteorites and asteroids. This project continues the research she started a graduate student at Rensselaer Polytechnic Institute. “Albion is very supportive with research,” she said. Zellner observes the physical structure of the lunar impact glasses, noting their locations and geological compositions. The compositions can help reveal if the moon once had a magnetic field, a necessary trait for a celestial body to have volcanic activity and, possibly, sustain life. The glasses range from 100-500 microns (0.01-0.05 centimeters) in diameter. 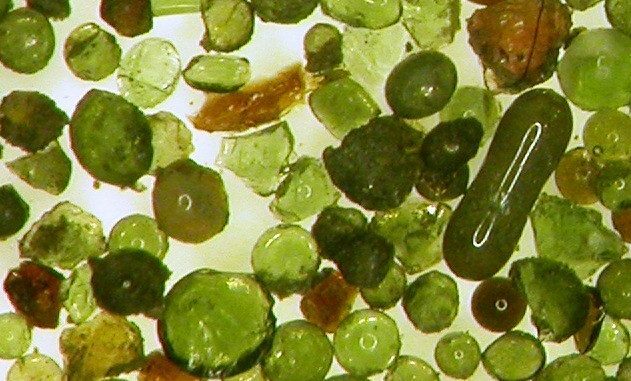 They appear as brown dust to the naked eye but are colorful when viewed with a high-resolution microscope. 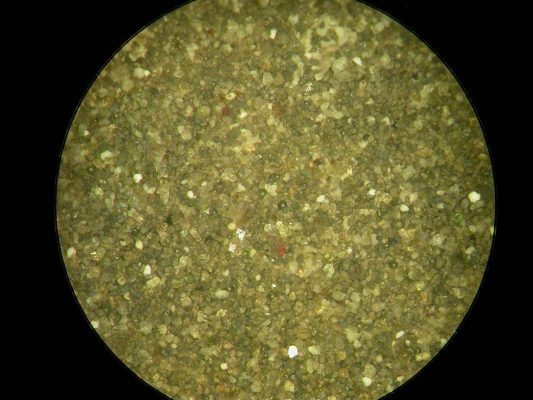 Zellner said to think of it like viewing sand with the naked eye and then up close, where the variety of colors is revealed. Zellner has sent 20 processed lunar-impact glass samples her colleagues in earth and planetary science, professors Roger Fu of Harvard University and Sonia Tikoo of Rutgers University for further research. They are interested in using these samples to provide insight into the time period during which the moon had an active magnetic field. According to Zellner, the moon once was a molten planetary object whose iron and nickel core rotated to create a magnetic field. The presence of a magnetic field is one form of evidence that life could exist. While the moon never supported life due to its low temperatures and lack of water, the samples could provide evidence of the moon’s ancient history. “I approached the pioneer of this [astronomical] field many years ago, but my samples were too small to examine the details of the glasses,” said Zellner. As time passed and instruments advanced, Zellner presented at multiple conferences which led to her collaborating with Fu and Tikoo. With Zellner’s lunar glass samples, the trio of researchers hopes to gain evidence of a time when the moon was geologically active because of the presence of a magnetic field. The integration of Zellner’s, Fu’s and Tikoo’s research of lunar glass and paleomagnetism could tell scientists more about the history of the moon, Earth and how life on other celestial bodies might be supported. Over 2,300 planets outside Earth’s solar system have been discovered by NASA’s Kepler Space Telescope. “If we can understand the conditions where we can form life, we can understand life,” said Zellner. Zellner may present at the annual Lunar and Planetary Science Conference in The Woodlands, Texas, where roughly 3,000 planetary scientists will come together to present and discuss updated astronomical research. While researching, the physics professor is also documenting alumni who contributed to the the field of astronomy at the turn of the 20th century. She works with the archivist Justin Seidler of Albion’s Stockwell-Mudd Library to obtain their anecdotal documents. Additionally, Zellner is working with an undergraduate student at Albion College to study why women and underrepresented groups are not retained in the science fields. Updated, 1/23/2019, 10:40 p.m. A previous version of this article stated that Earth’s magnetic field created the ozone layer. The ozone is protected by the magnetic field. The previous version stated that the moon has a molten core. It’s not known whether the moon has a molten core. The previous version stated that Zellner studied alien life. She does not. The previous version stated that Zellner sent in 20 samples to her collaborators each week. She has sent 20 in total. Changes have been made.